Rex Hawkins, with Hawkins Homes, LLC was awarded 2013 Home Builder of the Year. 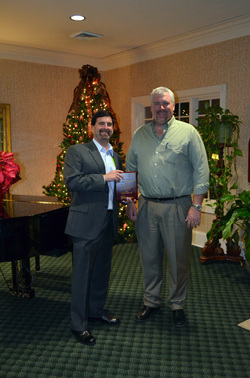 Award presented by 2012 Builder of the Year, Jeff Burkhart. _Orgain Building Supply was awarded 2013 Associate of the Year. Award presented by 2013 HBA President, Rex Hawkins with Hawkins Homes, LLC. 2003 - Todd Harvey - Byers & Harvey Realtors, Inc.
_Gary Norris was awarded 2013 Jackie Goad Hall of Fame Award. Award presented by Past President, Jim Maynard with Maynard Construction.